Grand Jury Will Probably Take Up the Dictagraph Probe While He Is Away. 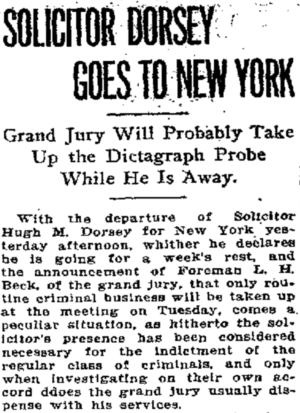 With the departure of Solicitor General Hugh M. Dorsey for New York yesterday afternoon, whither he declares he is going for a week’s rest, and the announcement of Foreman L. H. Beck, of the grand jury, that only routine criminal business will be taken up at the meeting on Tuesday, comes a peculiar situation, as hitherto the solicitor’s pretense has been considered necessary for the indictment of the regular class of criminals, and only when investigating on their own accord ddoes [sic] the grand jury usually dispense with his services. The assurance is continuously given out that the grand jury must finish its routin [sic] business before it can enter into a general investigation such as a renewal of the vice probe or an investigation of the Felder-Beavers dictagraph row, despite the apparent pressing need for clearing up the tangle that has grown from the affair. It appears that the members of the grand jury intend to take up at their meeting this week some investigation or other work in which the solicitor will not be needed and the general impression is that the dictagraph row will be probed. This would be in keeping with the vice probe which both the solicitor and the foreman attempted to veil in secrecy until the very day upon which it was started, and their actions upon this occasion strengthen the belief that further investigation will occupy the grand jurors at their next meeting. On top of this comes the announcement from an apparently responsible source of a demand made by Colonel Thomas B. Felder that the body probe the dictagraph affair, and the refusal of both the solicitor and the foreman of the jury to discuss this matter, or even to admit having received such a communication. Solicitor Dorsey gave out officially that his visit would be one of personal recreation and that he might possibly spend a short time at Atlantic City before returning home.